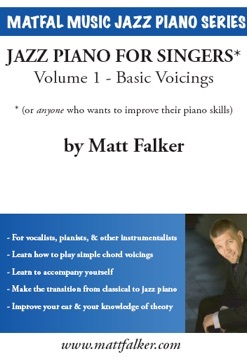 While the title of this DVD is “Jazz Piano For Singers”, it will be a useful tool for anyone who wants to learn how to play the most common chords and chord progressions on any lead sheet. My method will lead you through a step-by-step process of learning to play in every key. These skills can be put to use for accompanying yourself or other musicians, practicing improv, or just laying down some changes! The DVD covers material equivalent to a first-semester college level jazz piano class, and is designed for personal instruction or as the basis for classroom instruction. 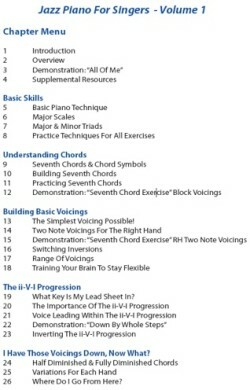 Watch for Volume 2, which will cover more advanced voicings.